Wedding Planning Story – with a twist – Peg & Pog! A wedding planning story with a twist! Are you looking for inspiration and ideas for your wedding planning? 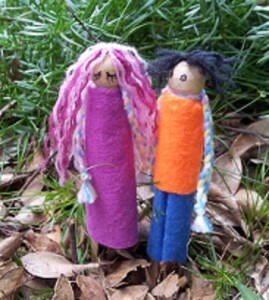 Peg & Pog, the delightful wooden peg dolls find love in the Rose Garden and can’t wait to start planning their wedding! Experience the delight and disasters and get caught up in the twists and turns of this delightful wedding planning story. Do dolls have personalities, just like people? Of course they do! Peg & Pog are the stars of the micro-series “Dolls are Different, or are they?” and have their own language of love. Helped (or hindered?) by various members of their families, they begin to plan their wedding. Can you relate to the challenges of planning a wedding where all involved are happy? Impossible, you say? Let Peg & Pog, assisted by Brisbane’s Very Good Celebrant, Glenda J Ashleigh, inspire and entertain you in this delightful wedding planning story! Wedding Planning Episode 1: Love blooms! In the first episode, “Love blooms,” Peg & Pog ‘discover’ each other in the rose garden that is ‘life.’ Peg and her little, 8 year old brother, DP, take a walk in the park. Peg stops to smell the roses and DP decides to … well, that would be giving the story away! It is enough to say that there is action, drama, pathos and happy endings. All dolls and the creator/director/producer etc etc, Glenda J Ashleigh, Brisbane’s Really Good Celebrant hope the first episode of “Dolls are Different. or are they?” inspires and entertains you as you plan your wedding. Wedding Planning Episode 2: Whose wedding is it anyway? Wedding planning is never smooth! Weddings, particularly in Doll families, are great occasions. Everyone who is anyone in the family feels the urge (and the obligation!) to contribute in some way to the celebration. No need to ask for ideas, suggestions, assistance or help. Everyone is only too willing to involve themselves in the wedding planning. In the second episode, “Whose wedding is it anyway?” Peg & Pog experience the ‘help’ their families eagerly offer to them. All dolls and the creator/director/producer etc etc, Glenda J Ashleigh, Brisbane’s Really Good Celebrant, hope the second episode of “Dolls are Different. or are they?” inspire and entertain you as you plan your wedding. The Doll families gather in the local park near the Rose Garden and the wedding planning picks up the pace! The family members, Molly & Polly, Dickie & Pago and DP are all fired up for the wedding of Peg & Pog. The mothers, Molly & Polly are eager to be the caterers for the wedding reception and are very excited about presenting their favourite dishes. Their menu is ‘different’ to say the least. The fathers, Dickie & Pago refine their creative contributions to the occasion and are proud of their unique offerings. Pog’s 2-yr old twin nieces, Pip & Pepper, make an impression, particularly on Big Bee! Then, of course, there is the exotic Madame Noscova and her ballet class of delightful ballerinas. In the third episode of this wedding planning story, “Where do we stand?” Peg & Pog are overcome by the ‘help’ and ‘creative activities’ of their families and decide to take action of their own! All dolls (and bees) and the creator/director/producer etc etc, Glenda J Ashleigh, Brisbane’s Really Good Celebrant, hope the third episode of “Dolls are Different. or are they?” inspires and entertains you as you plan your wedding. Wedding Planning Episode 4: A ray of sunshine! In Episode 4, “A ray of sunshine” Peg & Pog find Glenda J Ashleigh, Brisbane’s Really Good Celebrant, who is the ray of sunshine the lovebirds have been desperately seeking. Peg & Pog are swamped by Doll family members who are only interested in getting in on the wedding planning action, or so it seems! Not only do Doll family members push their ideas, but also new-found friends such as the exotic Madame Noscova. Wedding planning fever rages throughout the doll community! Glenda J Ashleigh, Brisbane’s Really Good Celebrant, listens carefully to Peg & Pog before giving them some ideas to think about. At last Peg & Pog feel that they are in control of planning for their special day! Peg & Pog have great fun as they start to plan their special wedding day! Perhaps Glenda J Ashleigh, Brisbane’s Really Good Celebrant, can shine a ray of sunshine on your wedding plans! All dolls and the creator/director/producer etc etc, Glenda J Ashleigh, Brisbane’s Really Good Celebrant, hope the fourth episode of “Dolls are Different. or are they?” inspires and entertains you. Wedding Planning Episode 5: Big Bee’s Wanderlust! Who knew that Wedding Planning could get physical? There is a new twist in the wedding planning story! Big Bee is a real ‘homebee’ content with buzzing happily among the roses, however a ‘stunning’ encounter with Pog causes Big Bee some unrest. The twins, Pip and Pepper chase Big Bee who takes refuge on Pog’s head. Polly (Pog’s Ma), tries to save Pog from Big Bee. Pog and Big Bee end up among the roses! Big Bee catches the first breeze to his new adventure. Big Bee’s wanderlust takes him far and wide. Big Bee loves the many new places, strange sights, dazzling colours and beautiful flowers. Not only does Big Bee make new friends with Bizz and Bozz, but he is also a popular participant in local bee buzzing contests. Big Bee even wins first prize for the ‘Best Buzz’ in his first contest! The effects of too many frenzied buzzing contests however take a toll on Big Bee’s particular ‘Bee-ness’. Big Bee decides to take a break from ‘wanderlusting’ and times his arrival home brilliantly! 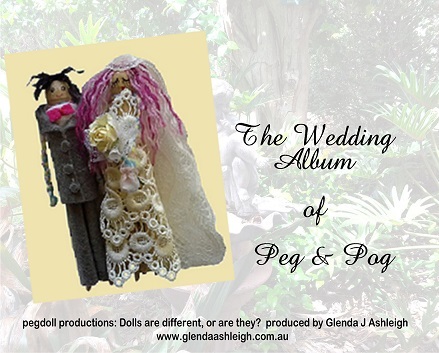 It is Peg & Pog’s wedding day and all dolls are excited on this especially joyous occasion. Big Bee (and all dolls) and the creator/director/producer etc etc, Glenda J Ashleigh, Brisbane’s Really Good Celebrant, hope the fifth episode of “Dolls are Different, or are they?” inspires and entertains you as you plan your wedding. Wedding Episode 6: Madame Noscova’s Moscow Mission! Madame Noscova, exotic Russian ballet teacher, suggests to Peg & Pog that the newly formed break-dance ballet group the ‘Beat Belles’ dance at the wedding. Peg & Pog really do not know what to say to an exotic Russian ballet teacher, not having met one before! Family members make plenty of suggestions and advice on what should happen on the wedding day. Peg & Pog are overwhelmed and cannot cope with any more ‘helpful’ or ‘creative’ wedding planning ideas! Before Peg & Pog know it, Madame Noscova and the Beat Belles start making plans. DP, ever the dedicated artist, is already inspired. He decides to stay home to ‘improve’ on that famous break-dance move, the ‘Orbital Rotation‘. Madame Noscova and the little ballerinas take off on their mission to be inspired! Adventure, excitement and delightful scenery await the little travellers. Thankfully, Madame Noscova and the Beat Belles find their inspiration, although they do get a little wet! All dolls (and Bees) and the creator/director/producer etc etc, Glenda J Ashleigh, Brisbane’s Really Good Celebrant, hope the sixth episode of “Dolls are Different, or are they?” inspires and entertains you. The Rose Garden is abuzz with excitement! It is Peg & Pog’s wedding day. Peg & Pog survive the many ‘helpful’ ideas and suggestions for wedding planning offered by the Doll family members. All Peg & Pog want is to marry in the Rose Garden. This is where they met and where their love first bloomed. Doll family members have their own ideas however, and insist on ‘helping’ make the wedding plans. Before Peg & Pog know it, the Doll family members and friends take over! Peg & Pog don’t want to hurt Doll feelings by refusing offers of ‘help’. Peg & Pog find their ‘ray of sunshine’ in Glenda, Brisbane’s Very Good Celebrant. Glenda listens patiently to their concerns and answers their many questions. Glenda guides them through the many ideas, options and practical strategies to smooth the situation and suggests some solutions. Finally, Glenda reassures Peg & Pog through her calm approach and the opportunity to discuss what they really want. Peg & Pog marry in the Rose Garden in a delightful wedding ceremony that all dolls enjoy! All cast members of episodes 1-6 return in episode 7 of this wedding planning story, and new and fascinating Doll family members also join in the fun and games of wedding planning. All dolls (and Bees) and the creator/director/producer etc etc, Glenda J Ashleigh, Brisbane’s Really Good Celebrant, hope the seventh episode of “Dolls are Different, or are they?” inspires and entertains you as you plan your wedding.